Melvin Holwijn moved abroad in 2003. 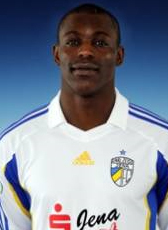 He played for 1,5 season in Greece before returning home. In mid-season 2004-05 he signed a contract for 1,5 year at Cambuur. His Greek club could not pay him anymore. In July 2006 Holwijn moved to Telstar on an amateur contract. The forward was under contract in Velsen until 2009. When his contract expired he went on trial at the German club from Dutch coach Rene van Eck, Carl Zeiss Jena. He was awarded a 1-year contract until 2010. His contract was not extended at the end of June 2010 and he was on a free transfer looking for a new club. In August 2010 he moved back to Telstar on an amateur contract. For the 2012-13 season, he went to Topklasse club FC Lisse. However after just one training, he decided to hang up his 'professional' boots and moved to the amateurs of Blauw-Wit because of personal problems. In November 2012 he made another surprising move abroad. He signed a monthly contract until January 2013 at English club Barnet where Dutchman Edgar Davids is the player-coach. At the end of his contract he returned home and started playing at the amateurs of Blauw Wit Amsterdam.